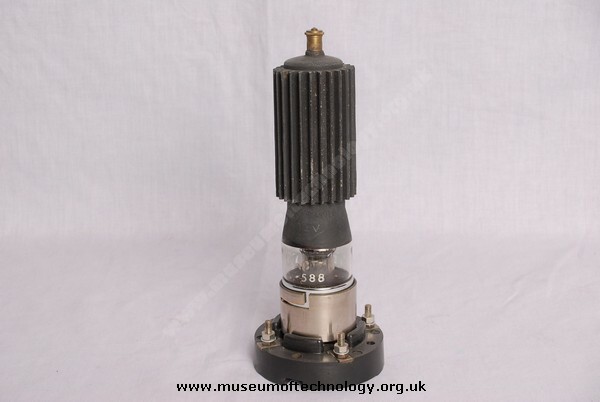 1.5Kv, 75 Watts air cooled Triode for transmitting use. ACT stands for Air Cooled Transmitter. Shown on a special Bayonet 4 pin base of the American 'Jumbo' type and has an Oxide Coated filament. Specially designed to work at wavelengths as short as 4 metres. In practice, the valve was suitable as as amplifier or oscillator down to 10 metres at full rating and down to 4 metres at reduced HT voltage. The anode was provided with a fluted heat sink to aid dissipation of the heat, but the valve would work with natural convection. The anode cooler was of cast aluminium, the outer surface being finished for radiation cooling, this was shrunk on to the anode by preheating and then applying it to the anode. Marconi used it as an oscillator in some of their transmitters.